Inside Improvisation explains how improv comedy works inside our brain and body, and how many of the concepts we take for granted in improv have a scientific basis. As improvisors, once we know the science behind something, we can find better ways to improve. For example, the concept of group mind is real and is caused by brain effects that can be studied and controlled, and is explained in detail in Inside Improvisation. 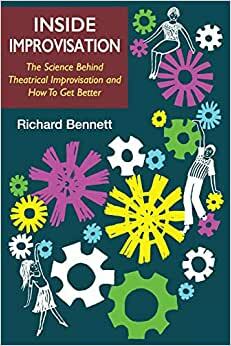 Referencing modern scientific theory and 100+ research papers, Inside Improvisation uses the science behind improv, to explain how it works and how to become a much better improvisor. Using science and improv theory, Inside Improvisation also explains for the first time ever, the differences between Chicago method long form improv and Harold, and Keith Johnstone's impro and Theatresports. This includes how and why they are different from both a theoretical and scientific point of view, how to identify them in practice, why they don’t work well together, and how to improve in each. Inside Improvisation also includes a new history of improvisation that references key developments across different gurus, and the key science behind those developments. Topics include: how the brain works while improvising; presence and mindfulness; fear, anxiety and the freedom to succeed; leveraging the unconscious; group mind; how scenes actually work - metapragmatics and scene progression; why and how improvisation is funny; using alcohol, drugs and stimulants; acting and theatre theory applied to improvisation; and much much more.